SANTA YNEZ, CA- Her "V" brand is immediately recognizable to most horse enthusiasts around the world, particularly Arabian horse owners. 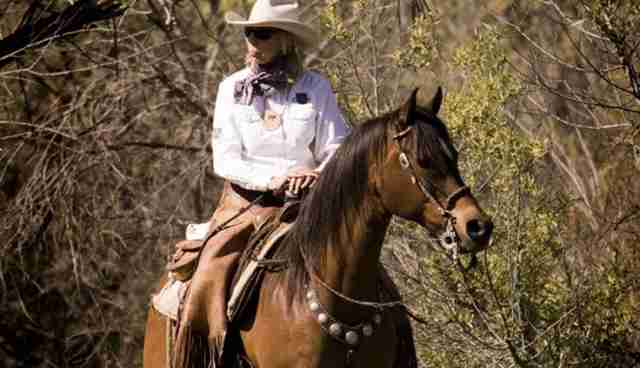 The acclaimed story of one of the world's greatest Arabian horse visionaries and Cowgirl Hall of Fame inductee will be retold as never before in a new, full-length documentary film entitled "V: The Legacy of Sheila Varian," premiering Saturday, August 2, 2014 at the Clark Center for Performing Arts in Arroyo Grande, Cal. In a twist-and-turn adventure, the film walks viewers through the epic story of Sheila Varian, known as one of the world's elite horse breeders and trainers. The film retells memorable stories from her childhood and early years as a school teacher, to the humble beginnings of Varian Arabians. It was during this time that a unique vision began taking shape that was initially scoffed at, but eventually created a legacy so far reaching that it is nearly unquantifiable in Arabian horse breeding around the world. "V: The Legacy of Sheila Varian" brings viewers into Sheila's personal, private world, and includes never-before-seen footage and photos from the early years of Varian Arabians. "You'll walk alongside a young Sheila as she learns from famous mentors and carries life-long friendships," says Evie Tubbs Sweeney, the film's producer. "You'll ride with her as she breaks world-records and ‘wins the world'-the Open Reined Cow Horse Championships at the Cow Palace in San Francisco-in 1961 to a stunned audience. You'll learn the nuances of what eventually developed her vision as a breeder. You'll feel the exhilaration of watching her first three Arabian mares step off the trailer after their overseas trip from Poland in 1961. You'll get to know the intricate personalities of all the equine characters in her story. You'll share her hurts, struggles and ultimate triumphs from walking a road less traveled. You'll be swept away by the beauty of her stallions that changed the Arabian breed forever, and her unique relationships with them. But most of all, you'll be inspired by what can happen when you dig deep to follow your calling, and end up changing the world." The film's historic premiere will include not only a presentation of the film, but also guest speakers, including Sheila herself. General admission tickets are $15. The event, held during Varian Arabians' Diamond Jubilee weekend, is expected to sell out to the 600-person auditorium, so purchasing tickets early is recommended. For those unable to attend, the premiere will be live streamed on iEquine.com. Further details to follow. The official event hashtag for the film's premiere is #svfilm. For more information and to purchase tickets, visit www.EvieInc.net. Exclusive photography and content available upon request. "V: The Legacy of Sheila Varian" is a film by Evie Inc., produced by Evie Tubbs Sweeney, directed by Emmy award-winning producer Millington Productions, Inc., written by Bob Sweeney, and co-produced by Sherry Conrads, in association with Platinum Performance. The film was made possible by private donors.